The flavour profile of a single origin chocolate,made by one of the world's fine chocolate makers, can be as complex and specialist as a fine wine. Also, the term "single origin" should not be taken as an assurance the chocolate is necessarily of a high quality, as this of course depends on who is actually making the chocolate and what quality of cocoa they are using. For a true understanding of this term and to avoid being mislead by clever marketing and packaging, read on.. Single origin chocolate is so called because the cocoa beans used to create it are taken from a single source/origin, in some instances a single estate or plantation but in most instances a single country. 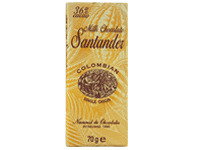 It refers to the origination of the cocoa beans used to create the chocolate and not the finished chocolate itself. The source and use of certain cocoa allows the chocolate maker to create particularly charismatic flavour profiles within each bar and quite unique to the next. To say that a single origin chocolate therefore is a good chocolate would be incorrect. There are good and bad single origin chocolates just in the same way there are good and bad olive oils, wines, vinegars and so on. To address this issue is a little more complicated as it addresses many different aspects and processes in the creation of a good chocolate. For instance, a particular origin, due to its unique geographical position, soil, climate and immediate habitat may produce an exceptional crop of cocoa, but if this is then not correctly harvested, dried, roasted and handled by a true chocolate maker using only the best methods will amount to nothing. The same can be said of the particular variety of cocoa used, a single origin chocolate does not guarantee that the variety and grade of cocoa used is of a high or low quality, just the origin. To fully understand what makes a great single origin chocolate is to inform yourself of all these variables and ultimately the reputation, integrity and craftsmanship of the chocolate maker. How do you do this? Well, we have spent years sourcing the worlds finest chocolate and learning all there is to know about its origins and manufacture. We do not have to market or promote our own chocolate and are completely independent to decide which brands to include in our collection, and which of course to recommend. There are particular countries, such as Venezuela and Madagascar that are renowned for producing the finest cocoa in the world. Whilst this sort of statement may be used as a general rule of thumb it is a general statement none the less, and in certain instances may even be used to mislead the consumer, which I shall cover later. As “Single Origin” can be as broad a description as describing that the cocoa used originates from a single country then this again is open to many variables. Many chocolate makers detail further the origin, such as the name of the plantation or estate and also the cocoa variety, this certainly informs the consumer that not only is the chocolate maker proud to display the quality of cocoa used to create the chocolate, they are even going as far to highlight the name of the plantation or estate, allowing us the opportunity to check its credentials if we so wished. Often it is not possible for a chocolate maker to source fine flavour cocoa from one plantation alone due to the practicalities of supply and demand, also the way cocoa is sold on the world market. To buy cocoa originating from one country eliminates many supply problems that otherwise may happen from a single plantation or estate. A poor harvest, disease or natural disaster can affect a cocoa harvest as any other crop and so to limit the supply to one particular plantation requires a considerable gamble with the supply chain. Many of the top chocolate makers either own or manage the land on which the cocoa is grown to ensure as much control as possible and lessening the risk. A.D. 600 the Mayas undertook a massive migration which led this highly civilised people from Central America deep into the northern regions of South America. In Yucatan they established the earliest known cocoa plantations. There is no doubt, however, that the Mayas must have been familiar with cocoa several centuries earlier. By subjugating the Chimimeken and the Mayas, the Aztecs strengthened their supremacy in Mexico. Records dating from this period include details of deliveries of cocoa which were imposed as tributes on conquered tribes. On his fourth voyage to America, Columbus landed on 30th July 1502 in Nicaragua and was the first European to discover cocoa beans. These were used by the natives as currency and also in the preparation of a delightful drink. But Columbus, who was still searching for the sea route to India, was not interested in cocoa. Hernando de Oviedo y Valdez, who went to America in 1513 as a member of Pedrarias Avila's expedition, reports that he bought a slave for 100 cocoa beans. Hernando Cortez, who conquered part of Mexico in 1519, finds the taste of cocoa not particularly pleasant and is, therefore, much more interested in the value of cocoa as a means of payment. He immediately establishes in the name of Spain a cocoa plantation where, henceforth, 'money' will be cultivated. In 1528, Cortez brings back to Europe the first cocoa and the utensils necessary for its preparation. 'Libro en el cual se trata del chocolate' is the title of a book which appeared in Mexico in 1609. It is the first book devoted entirely to the subject of chocolate. The Spanish princess Anna of Austria marries Louis XIII and introduces, amongst other Spanish customs, the drinking of chocolate at the French court. London's first chocolate shop is opened by a Frenchman in 1657. After Pope Pius V had found cocoa so unpleasant that he declared, in 1569, that "this drink does not break the fast", the supreme church of Rome became more and more tolerant towards the exquisite beverage. The question of the fast took on a new urgency. In 1662, Cardinal Brancaccio hands down the judgment of Solomon:"Liquidum non fragit jejunum." In other words:"Liquids (in the form of chocolate) do not break the fast." Clearly, one had to wait until Easter to indulge in the eating of chocolate. 1670 The Fate of a Seaman Helmsman Pedro Bravo do los Camerinos decides that he has had enough of Christian voyages of exploration and settles in the Philippines, where he spends the rest of his life planting cocoa, thus laying the foundations for one of the great plantations of that time. A clumsy kitchen-boy drops a bowlful of almonds on the floor. The angry chef tries to box his ears and, in the process, spills a panful of hot, burnt sugar over the almonds. The Duke of Plesslis-Praslin, a marshal who is renowned as a gourmet, is waiting for his dessert. "What now?" thinks his personal chef and, in desperation, serves the marshal with the almonds covered with a coating of cooled sugar. The guest is delighted with the novel dessert and promptly gives his name to the new sweet. Not, however, the full name, but simply "Praslin". Since then this sweet has undergone many changes, including the development of the modern term "praline" from the original name. "At the Coffee Mill and Tobacco Roll" was the name of a famous London coffee-house where, as early as 1674, one could enjoy chocolate in cakes and rolls "in the Spanish style". On the strength of a royal decree dated 1st November 1677, Brazil - later to achieve an important position in the world market - establishes in the State of Para' the first cocoa plantations. Heinrich Escher, the mayor of Zurich, visits Brussels where he drinks chocolate and returns to his home town with tidings of the new sweet drink. Towards the end of the 17th century, chocolate makes its appearance in Germany. The policy of restricting the importation of foreign produce leads Frederick I of Prussia to impose a tax on chocolate in 1704. Anyone wishing to pay homage to its pleasures has to pay two thalers for a permit. Emperor Charles VI transfers his court from Madrid to Vienna in 1711. With the court, chocolate moves in by via the blue Danube. As early as 1720, the coffee-houses of Florence and Venice are offering chocolate whose reputation reaches far beyond the country's borders. Italian chocolateers, well versed in the art of making chocolate, are, therefore, welcome visitors in France, Germany and Switzerland. In the year 1747, Frederick the Great forbids all manner of hawking, especially the hawking of chocolate. America, in those days not yet the land of plenty, learns of chocolate relatively late, in fact, not until 1755. About the year 1780, the first machine-made chocolate is produced in Barcelona. The Josty brothers from the Grisons made a major contribution to the reputation of Swiss chocolate in Germany. In 1792 they open a confectioner's shop and chocolate factory in Berlin. Eberty, the historian, sings the praises of their products: "Everything which one got at Josty's was excellent, and the chocolate really first rate." Johann Wolfgang von Goethe does not have much confidence in the Swiss hotel industry. For his tour of Switzerland in 1797 he includes in his luggage chocolate and a chocolate pot. Venezuela's leading position in the production of cocoa is established. A survey in the year 1810 shows that this country produces half the world's requirements. One third of the world's entire cocoa production is consumed by the Spaniards. The first Swiss chocolate factory is set up in a former mill near Vevey. The founder, Francois-Louis Cailler, had learned the secrets of the choco- late-making trade in Italy. The Portuguese Jose Ferreira Gomes introduces the cocoa tree as an ornamental plant on the small island of Principe in the Gulf of Guinea off the west coast of Africa. Under the encouragement of the Portuguese Baron of Agua Ize, the culti- vation of cocoa passes from Principe on the neighbouring island of Sao Thome, and from there to the African continent. In Ghana, the members of the Basle Mission promote it successfully. Surprisingly quickly, the many small and medium farmers develop the country into one of the most important producers. After eight years of experiment, the Swiss Daniel Peter puts the first milk chocolate on the market in 1875. Rodolphe Lindt of Berne produces chocolate which melts on the tongue for the first time in the year 1879. Spain, formerly the classic land of chocolate, falls far behind. Germany takes the lead in consumption per head, followed by the United States, France and Great Britain. In just a decade or two another country will be playing first violin in the orchestra of the chocolate nations - Switzerland. The reputation of Swiss chocolate, bolstered by unbroken series of medals at international exhibitions, has not only fallen upon the ears of foreigners. It has also conquered Swiss palates. Like bratwurst, rösti and fondue, chocolate has become a national dish. 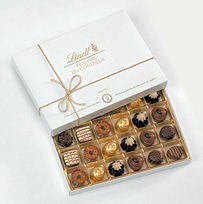 Lindts selection box; Swiss Chocolate at its best!